The post-Thanksgiving journey through the prairie lands of Wisconsin is a yearly ritual for those seeking to be part of the Madison Scouts' brotherhood. But for some that trip crosses more than just state lines. The Scouts find themselves with a new and rapidly growing fan base in Japan, a hotbed of competitive marching bands and drum corps activity. Fueled by video sharing sites like YouTube, the Madison Scout shows are being seen and shared throughout Japan, creating new fans and new Scouts. Yuki Itoh, mellophone player, made the long trip from Tokyo for another audition weekend. Entering his fourth season with the Scouts, Yuki was one of seven members from Japan who marched in the corps last season. Tomohiro Hirano was part of a handful of Japanese hopefuls who endured more than 24 hours of air travel to make their way to Madison. With his marching experience in the Imperial Sound of Japan, Tomohiro hopes to join the four returning quad members from last year and become a member of the Scouts. The Thanksgiving weekend brought the start of the 18th season for the Jersey Surf, with the warm sights and sounds of summer in full bloom inside the walls of the corps rehearsal facility in Berlin, N.J. More than 280 returning and new members packed the Camden County Technical School for the weekend's events, participating in hands-on workshops and enjoying their introduction to the drum corps lifestyle. Some 75 members returning from the 2007 corps arrived on Friday evening, and assisted with the setup for the weekend prior to holding a corps meeting with executive director Bob Jacobs. 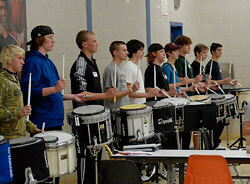 "We were incredibly impressed with the amount of talent that came to audition for the horn line. There were more than 90 auditionees in the brass section this weekend, with even more expected at our next camp," said Harrison Horowitz, a Jersey Surf brass staff member. "Thanks to the down-to-business attitude from our returning veterans and the high level of ability of the entire ensemble we were able to accomplish a huge amount of progress in a very short amount of time. This is sure to be an incredible summer for the Jersey Surf brass program!" Visit JerseySurf.org to read more and to view a photo gallery. Sunday, Nov. 25, the Citations hosted an audition camp for returning and prospective brass and percussion members in Burlington, Mass. More than 90 percent of the 2007 corps members registered for 2008 and students from more than 10 different school districts were represented. 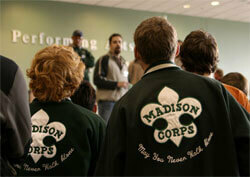 "The most exciting thing is the talent within the corps from day one. Not only was there a great turnout, but most of the rookies have a really good handle on their marching and musicianship," said Citations drum major Mike Rawding. "Likewise, the new and returning staff members had an incredible amount of skill and energy. The Citations' 2008 season will certainly propel the group to new levels." Brass and percussion members worked mostly in sections throughout the day on playing techniques. The Citations expect to field their largest corps in history in 2008 with nearly 90 students already registered. Visit Citations.org for more 2008 audition information.